It is not like a normal hotel or bech resort where you just stay lied in a deckchair. Original and cool surf accommodation is made for all people with passion for surfing and thus surf hostels and surf camps have usually some extras for us, surfers. What do we love the most are surf hostels and original surf houses which are run by surfers for surfers, so everything is adapted to the surf spirit and spending time in cute stylish surfhouse is a part of surf traveling. Living in the great beach surf house is very good way of spending surf time in Portugal. How to find good accommodation designed for surfers and what is important when searching for quality Portuguese surf house. 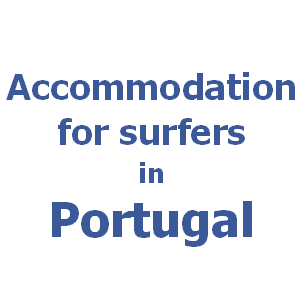 Here are some information and tips for surf accommodation in Portugal. Portuguese people are known for their hospitality which you can experience in the surf hostels and surf camps, too. For your surf holidays in Portugal you can choose from variety of surf accommodation. From little houses next to the ocean to surf hostels with great atmosphere or surf camps. Every surf place has its own spirit and different things to offer. In a cool surf accommodation you should have a possibility to rent a surf material or take a surf lesson with professional surf instructor. Surfing packages in camps, hostels and surfhouses provides the best prices. The surf accommodation should be straight next to some surf spot where you can get by feet. If not, make sure that they provide free transports to surf spots. Good surf hostels and camps might organize some yoga sessions too. Real surfing places provide an equipment for your surf training. It can be a little gym or they might have some indoboards or slacklines to train your balance. Another common service is renting bicycles or skates. Some surf accommodations have even a swimming pool, which can be also very usefull for your training. Another very important thing about surf accomodation is the design that makes the particular surfing spirit of the place. Every surf house is specific with its decoration, mostly some pictures of waves and surfers. You can also find there some maps and information about local surf spots and other details. Look at the example of well designed surfhouse and get inspired. The best surf houses have their own stylish surf house facebook profile. Usually there are hammocks to take a rest after surf session. Every surf place should have some barbecue, where surfers can join, meet each other and talk about the waves they caught. Finally, every cool surf place is close to some good surf bar. These are reasons to choose some specific surf accommodation for your surf holidays in Portugal. They might have special package and favourable prices with accommodation, surf lessons, surf rentals and other activities. Choose here your place to stay for surfing in Portugal, read the references or contact us to help you find your surf house, hostel or camp. Enjoy your surfing and making friends in Portugal.